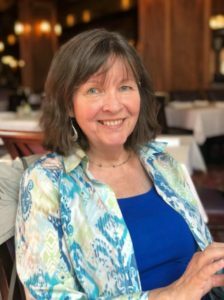 The Almond Grove displays that sense of community from October to January especially, when it steps out as the best decorated corner of Los Gatos with a huge percentage of participation in the effort. Halloween is a great example. People’s enthusiasm is evident in by the beginning of October as props come out for the spookiest day of the year. Sometimes even in September, “Land of the Giant” sized spiders begin to appear, life-sized ghosts start to swing from porches and trees, the normally tidy and trim picket fences become smudged with spider webs, and every manner of Halloween decor drapes the district. On Halloween night, the Almond Grove district becomes positively overrun with enthusiastic kids from all over Los Gatos. I’ve been told that some homes get as many as 1,000 trick or treaters on Halloween night there. What kind of homes do you see? There are a few mid-century apartments but many houses, probably more than 80%, are truly historic properties. Also there’s some diversity of architectural style, including many Victorian homes (probably the most common) but also Craftsman, Spanish or Mediterranean, English Cottage, Tudor, Ranch and remodels with a mix of flavor. (In the nearby Glenridge neighborhood just up the hill you will also see Art Deco, Colonial, and others too). Many of the older homes began as small residences, but in more recent decades have been expanded. 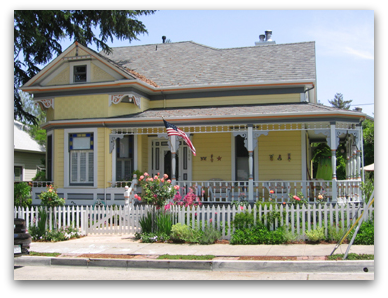 Regulations regarding historic Los Gatos real estate are substantial. When expansion is permitted, often it must be such that the front of the home looks close to original – down to the glass in the windows. The majority of the time, enlarging a home means going back into the rear yard rather than up, or if up, toward the back of the home. Understandably, the Los Gatos Planning Commission cares a great deal about preservation of the character of the neighborhoods in town. If you can, visit the Almond Grove neighborhood in person – take a stroll down the tree lined streets yourself and take in the ambiance. Alternatively, I shot some video – my first attempt at videotaping a neighborhood in town (my daughter was driving) so please don’t mind the sometimes crooked angle of the camera. The roads are a bit bumpy but this area is set to be repaved soon. 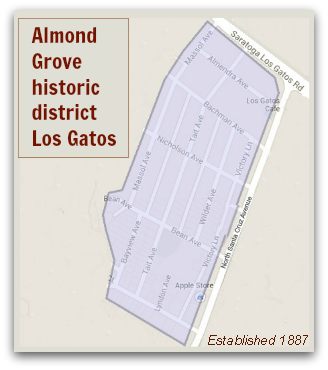 Find real estate and homes for sale in the Almond Grove neighborhood of downtown Los Gatos! 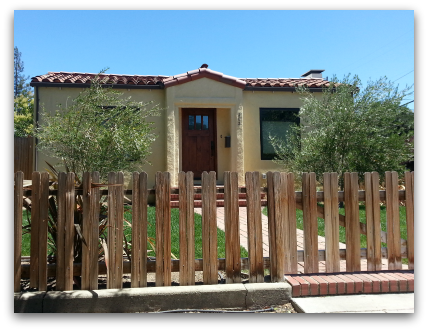 Please browse available homes for sale in these charming older areas of Los Gatos.